I was playing with some embossing folders from Generations Crafting this past weekend. It was really fun to play with different techniques. wow! That was awesome! thanks so much for those techniques! you are very talented. I love this idea. I never thought of using two folders on one card. Thanks for sharing. I do have a question...On the last sample with the green spray...What kind of cardstock did you use? I know you usually use PTI but on the video is almost looked liked glossy cardstock? Love Love Love!! Thanks for the tips! Wow! I'm simply amazed and now I need to make some more projects with the embossing folders! Thanks for the video and thanks for making the cards! Hugs! way cool Christina. Im not much of a card maker but you sure give me inspriation to make more of them. Thank you these are awesome techniques and the cards are stunning! Thanks for sharing this with us! 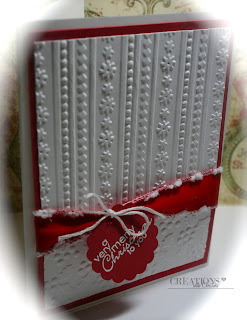 I am new to heat embossing so I just loved the how it looked like snow on the trees!! Love the tips for add to the embossing folders. Just in time! I'm receiving some embossing folder today and I was going to search for some fun ideas! I love the 3rd one the most. Wait, no the 2nd one w/ the trees. Ok, they are all awesome! Thanks for sharing. Thank you so much for showing us these fabulous techniques!! Also want to tell you received my Gypsy DVD yesterday and absolutely love it!! You done a fabulous job, now if Santa would hurry up and give me my Gypsy. Seventeen more days!! Great new folders. Thanks for showing us your projects. Oh, Oh My! What gorgeous cards. I am a beginner in embossing and had no idea you could use it so many ways. Truly beautiful. Thank you so much for sharing. Really beautiful cards Christina! I learned a few new tricks! thanks. Beautiful cards and great vid sis!! I love it! I've got so many of thse embossing folders and don't use them nearly enough. This gives me incentive to get them out and use them! love all the tips you gave. I learned some new ones. Thank you so much. These are fantastic! I've never thought of using the folders that way. And I LOVE to emboss... thank you for opening up a whole new world for me! Thanks so much for the inspiration Christina. Christina, Great idea love the results. Thanks for showing this. I use embossing folders a lot. Wow, these are awesome! Thanks for sharing all these techniques. Thanks, I just received my Cuttlebug with several embossing folders and have been looking for embossing ideas. You have given me some great ideas. Thanks for the enabling! I went to Generations Crafting and bought myself an early Christmas present - 4 sets of embossing folders, 2 Hero Arts stamps, and the last Jovial Collection they had! Merry Christmas to me and to you! Thanks for sharing your talents. 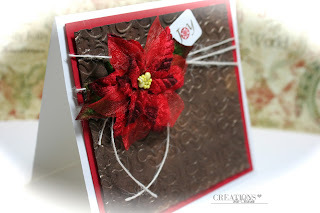 Very creative ways to use the embossing folders. Wow beautiful cards and now DP. I love the effect you created. Great techniques!!! LOVE your projects! Just ordered the pine embossing folder. Your card was so beautiful with it. Thanks for the inspiration.